Oldsmobile wasn't the first American car company to produce a front-wheel drive car. Most aficionados remember the beautiful, mid-30's Cords, but they were, in fact, the last company before the 1960's to build a successful front-wheel drive vehicle. Before Cord was the Miller-Ford, a Packard experimental car, the Gardner, Ruxton, Gregory, Christie and even a never-produced patent for the Selden of 1879. Add to those the many experimental FWD cars that private individuals — chiefly carriage makers — must have cobbled up and you have a broad history of such vehicles. Oldsmobile Division engineers wanted to do a front-drive, small car (the F-85) when the 60's started and GM management eventually agreed on the concept. After all, fwd had the advantages of a flat floor, more traction, better cornering and the cost-savings of an integrated power unit. What GM and Olds top managers didn't agree with was the idea of making a small car to showcase such a unique drivetrain. They wanted Olds to make its own version of the now-successful Buick Riviera and that meant a bigger car based on the GM E-body, then shared by the Riviera and eventually the Eldorado. Olds designers, led by stylist David North, were given the green light to design a full-sized, front-wheel-drive luxury car that would hold 6 passengers comfortably. Powerplant development at any automobile company always takes many directions in its considerations for future drivetrains. GM's engine/transmission designers had toyed with various front-drive concepts since the mid 1950's, but 4- and 6-cylinder engines were found lacking. Also, a major hurdle in creating an integrated power unit (engine/transmission/axle) was: what to do with the transmission to both couple it to an engine and rotate it 90 degrees to drive the front wheels. No small feat, that, since all GM engines were longitudinal in design. The solution to the transmission problem came in 1964 from GM's Hydra-Matic Division. It was called the Hy-V0. It utilized a silent chain that was strong, flexible and inexpensive enough (in spite of its more than 2000 pieces!) to use in production. This breakthrough allowed the drivetrain engineers to separate the torque converter from its gearbox, thus allowing them to stuff the total power train into the same space normally occupied by the engine alone. On top of that, the Hy-Vo could take a lot of engine power. GM's Most Powerful Front-Drive Ever! 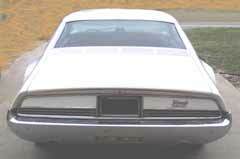 Oldsmobile management dictated from the beginning that the Toronado had to be powered by the same engine used in the 88/98 series cars. This engine, a 425 cubic-inch, 385 horsepower, high torque, cast iron unit, was big and heavy to say the least. The size and power of the engine didn't make the design of the integrated power unit any easier, but in the end the Toronado would be — and still is — the most powerful front-wheel drive car made by GM, or anyone else for that matter. The 1966 Oldsmobile Toronado was a gorgeous car, too. The outside, with its dramatic front and rear fender flares, the wraparound grille, hidden headlights and fastback roof was striking from any angle. It was elegant and racy at the same time. Inside it was pure Oldsmobile, but the materials were top-grade and the dash looked like it was hovering in mid-air, due in no small way to the lack of a transmission tunnel. Oldsmobile used combination CV (now so common that everyone assumes they've been around forever!) and Rzeppa axle joints, along with torsional dampers. This combination would make the ride and "road-feel" seem as smooth as possible, while minimizing the inevitable torque-steer and pulsations from the power strokes of the engine. Due to the complexity and expense of adapting the T-400 automatic transmission to the Toronado, no manual shift option was ever considered. Overall, the Toronado's acceleration was brisk (0-60 in 8.9 sec.) and braking excellent. The front-drive's weight made for a tendency to understeer, of course, but the Toronado's agility wasn't any worse than most other Detroit products of the era. What Does the name Oldsmobile Toronado Mean? Bet you thought we wouldn't write about the origin of the Toronado name. Well, as the story goes, no one could come up with a good name for the new Oldsmobile model, even after many meetings and brain-storming sessions. According to Stanley Wilen, one of the Olds design team at the time, Chevrolet's general manager Bunkie Knudson happened to visit the Olds office during one of those sessions and told the Olds people that they could have one of Chevy's registered names if they wanted it. Chevy had decided not to use the name "Toronado" on one of its cars because they couldn't figure out what it meant. It never meant anything and never stood for any concept. It just sounded good. We think the 1966 Oldsmobile Toronado was, and is, a neat car in every way. It's also one of those collector cars that can be acquired for little money and be driven daily without fear of constant breakdown. A top-condition Toronado can be purchased for less than 10 Grand, and very restorable examples can be found for one third that amount. Parts are easy to get in any case, and how many classics will carry you, three passengers and the luggage on a 400-mile trip and get you there in air-conditioned comfort?